The 2030 Agenda for Sustainable Development sets out a universal plan of action to achieve sustainable development in a balanced manner and seeks to realize the human rights of all people. It calls for leaving no one behind and for ensuring that the Sustainable Development Goals (SDGs) are met for all segments of society, at all ages, with a particular focus on the most vulnerable—including older persons. Preparing for an ageing population is vital to the achievement of the integrated 2030 Agenda, with ageing cutting across the goals on poverty eradication, good health, gender equality, economic growth and decent work, reduced inequalities and sustainable cities. Therefore, while it is essential to address the exclusion and vulnerability of—and intersectional discrimination against—many older persons in the implementation of the new agenda, it is even more important to go beyond treating older persons as a vulnerable group. Older persons must be recognized as the active agents of societal development in order to achieve truly transformative, inclusive and sustainable development outcomes. The current brief acknowledges the importance of a life-course approach to ageing and calls for protecting and promoting the rights of older persons in the implementation of the 2030 Agenda. This action plan builds on the momentum and spirit of the 2014 World Conference on Indigenous Peoples and to this end will promote partnership and collaboration between the UN system, civil society organizations, and multilateral bodies such as regional development banks and human rights special procedures and commissions. This system wide action plan will contribute to the fit for purpose agenda by ensuring stronger linkages between the normative and operational work of the United Nations, increasing coordination and coherence in addressing the rights of indigenous peoples. It calls for strengthened United Nations senior level engagement, encouraging work with Member States in a spirit of partnership and cooperation to generate support for the implementation of the Declaration on the Rights of Indigenous Peoples. As such this action plan implies the need to advance the rights and well-being of indigenous peoples, in the field and at headquarters, including by shared analysis, common strategies and greater accountability. For this action plan to be effectively implemented at the country level, it is important that United Nations Resident Coordinators are empowered and supported from the highest levels at headquarters. Only by ensuring the adequate political traction both at the global and country level, will the dialogues and programmes between indigenous peoples, Member States and United Nations be fruitful in advancing the rights of indigenous peoples. The 2030 Agenda’s pledge to leave no one behind demands that progress towards the Agenda’s goals and targets be faster among the most disadvantaged social groups. 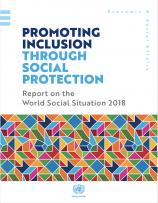 Without quicker improvements among those who are lagging further behind, the systematic disparities described in the Report on the World Social Situation 2016 (United Nations, 2016) will not decline. While the data needed to monitor progress in all goals and targets for each group that is disadvantaged or at risk are not systematically available, the existing data illustrate the complexity of establishing whether some people are being left behind. Much depends on contexts and on the indicators used to assess progress. Health inequalities between social groups, for instance, have evolved differently across countries, regions and by group. By way of example, figure 1 shows recent trends in Sustainable Development Goal (SDG) Indicator 2.2.1, the prevalence of stunting (having a low height for age) among children under age five by ethnic group in three developing countries. Read the Social Development Brief: Leaving no one behind? Mixed Success. UNDESA Division for Social Policy and Development (DSPD) launched the 2016 Civil Society Participation Evaluation Report based on a CSocD54 post-participation survey, that asked registered representatives about the quality of their participation. The 54th session of the Commission for Social Development (CSocD54) took place from 3-12 February 2016 at the United Nations Headquarters in New York, under the priority theme “Rethinking and Strengthening Social Development in the Contemporary World”. A total of 320 representatives from 124 ECOSOC accredited organizations attended the session. The regional distribution of participants was disproportional with 71 percent of participants coming from North America and 11 percent from Europe, Africa, Asia, and Latin America and the Caribbean sent a combined 18 percent participants. To increase representation, it is recommended that Member States include civil society members in their delegations and take a more active role in the Commission. For UNDESA DSPD, improving outreach and better data collection of participation should be implemented to increase civil society engagement with Member States. NGOs are encouraged to reach out to other organizations and representatives to promote the Commission, encourage younger members to participate and to engage in cross-issue collaboration of written and oral interventions as well as side events. Read the 2016 Civil Society Participation Evaluation.